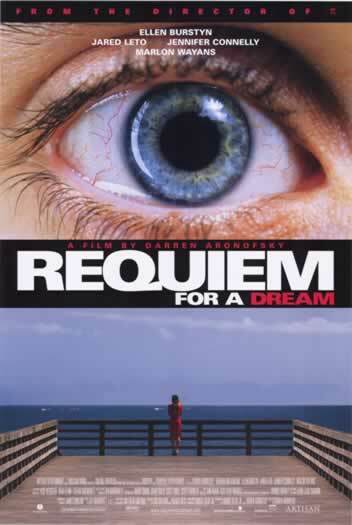 The Story: Requiem for a dream is a sad story to watch unfold, there is no happy ending in Requiem For A Dream, and there shouldn't be because that just wouldn't make any sense. The fast cuts and the soundtrack mixed together take you for one wild ride in your seat as you watch this epic drug film. View at your own risk. If you can handle the rush. Jared Leto is perfect as the confused Harry along with his lonely mother, Sara Goldfarb played by Ellen Burstyn. As well as his girlfriend/best friend and fellow junkies Marion and Tyrone, played by Jennifer Connelly and Marlon Wayans. This is tastefully done time-line of the unraveling of the lives of junkies, the audiences watches with their jaws dropped as the lives of the protagonists decay, flourish, and end up in new twists showing a shocking view that a "clean world" normally doesn't see. Requiem for a dream needs to be watched more than once to fully appreciate. Not everyone is going to like this artistic film that leads down a path of self destruction through addiction.